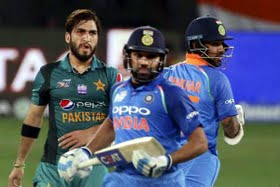 India captain Rohit Sharma said his team is looking forward to the Pakistan challenge for the second time in the Asia Cup 2018 after defeating Bangladesh by seven wickets in their previous encounter. "When everything goes to plan, it looks easy. We will go back and recover and come back fresh against Pakistan and try to replicate this performance," Rohit said at the post-match presentation. India face Pakistan in the super four clash on Sunday. Rohit admitted that India will need to replicate their performance against Bangladesh on Sunday. "It was a clinical performance from the start. We bowled very well and we always knew it was going to be better batting under the lights. Very good from everyone. It was important on a pitch like that to rotate the bowlers and now allow the batsmen to settle," Rohit said. The captain was extremely pleased with Ravindra Jadeja’s star turn on comeback. "Jadeja, playing an ODI after a long time, to come out and bowl like that was a great effort from him. Great effort from everyone, I don't want to single out anyone," the captain stated.